Thousands of Retrievers came together as a community on Saturday night—alumni, faculty, staff, and students from all five decades of UMBC history—to celebrate the remarkable story of UMBC. 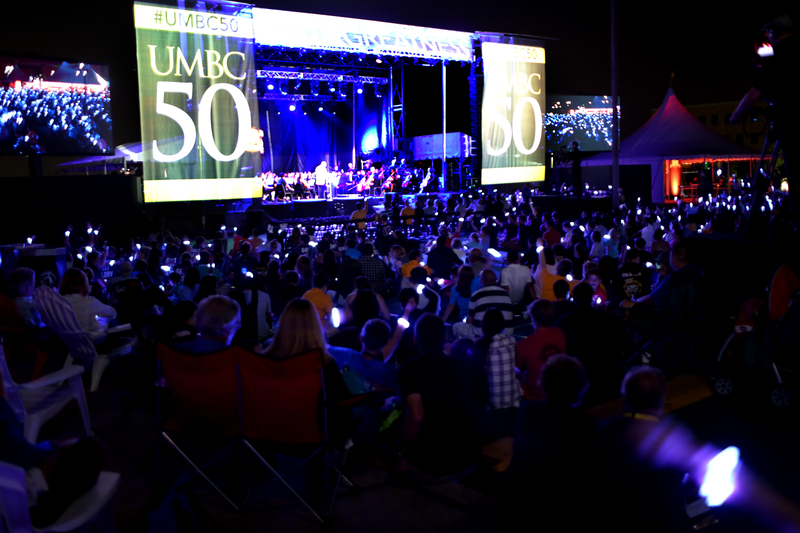 On the night of the anniversary festival, September 17, 2016, the founding generation of Retrievers who together created and shaped UMBC over the course of its first 50 years, had an opportunity to honor that achievement, salute one another, and set the stage for the next half-century. Together they cheered for a dazzling display of fireworks at the top of UMBC’s hilly campus, transforming from a flurry of twinkling stars to astounding fireballs. Center stage, before the backdrop of fireworks, was the UMBC Symphony Orchestra—a microcosm of UMBC’s inclusive excellence—performing Stravinsky’s gripping Firebird. 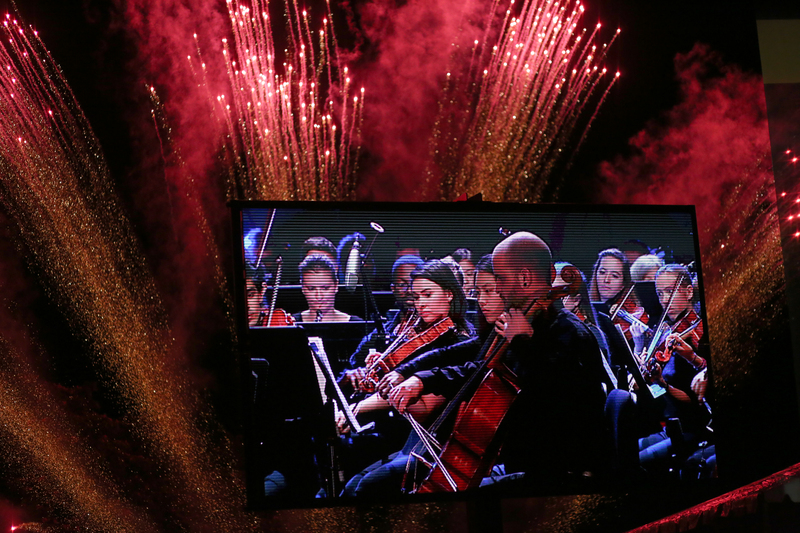 UMBC Symphony Orchestra performs “Firebird” at the 50th anniversary finale. “That’s been true for 50 years now,” said Salkind. 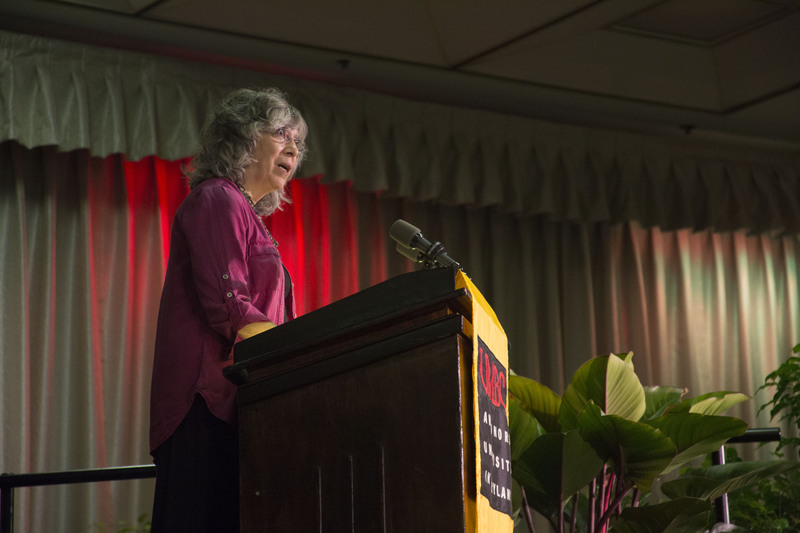 Wendy Salkind speaks to the crowd during the Roots of Greatness lunch. At GRIT-X, later that afternoon, faculty and alumni presented a series of engaging talks demonstrating UMBC’s broad impact in research, scholarship, and creative achievement. Speakers covered topics from the process for creating a successful theatre company to dealing with contaminants of emerging concern in local watersheds. 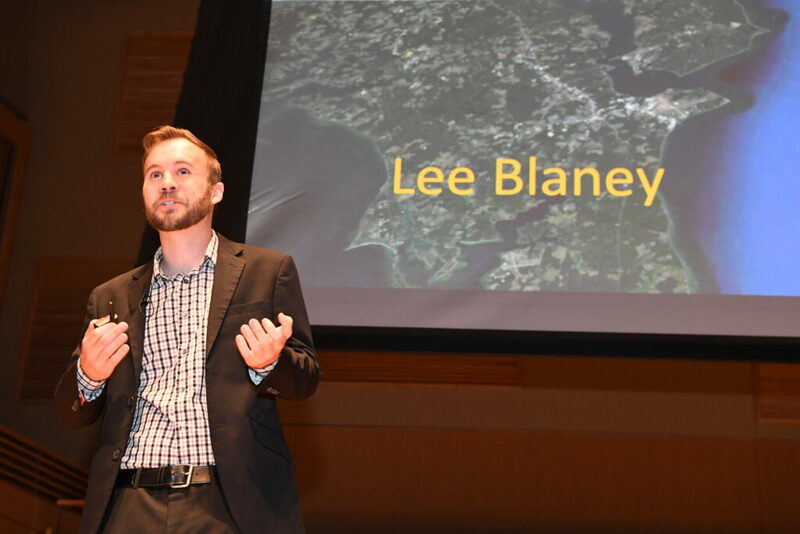 Lee Blaney, associate professor of CBEE, presents at GRIT-X. 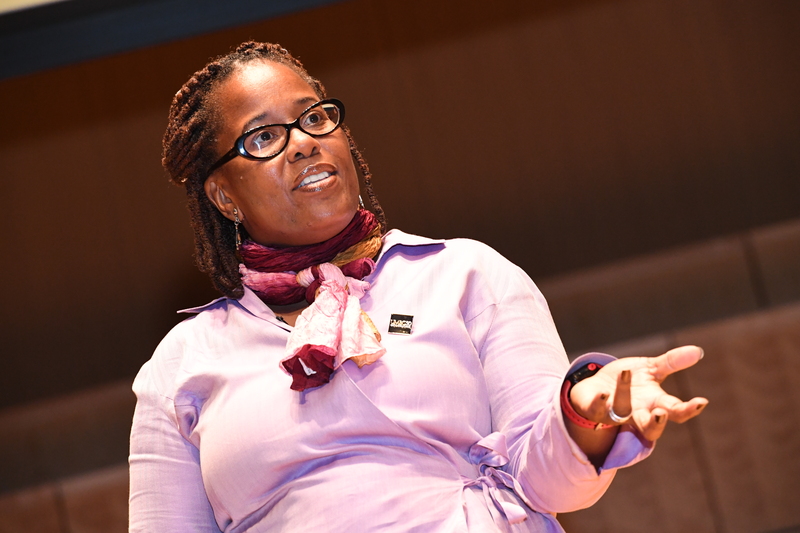 Karsonya “Kaye” Wise Whitehead, Ph.D. ’09, LLC, associate professor of history at Loyola University, presents at GRIT-X. The House of Grit was one of the largest attractions of the 50th anniversary celebration. Named for UMBC’s character and spirit, this community festival showcased programs and communities from across the university. 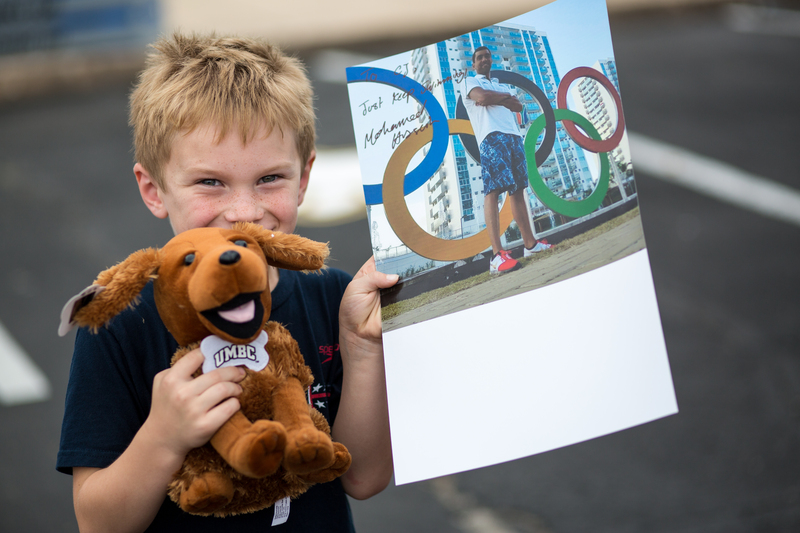 Young festival-goer holds a photo signed by UMBC Olympic swimmer Mohamed Hussein ‘14, mechanical engineering and current graduate student. 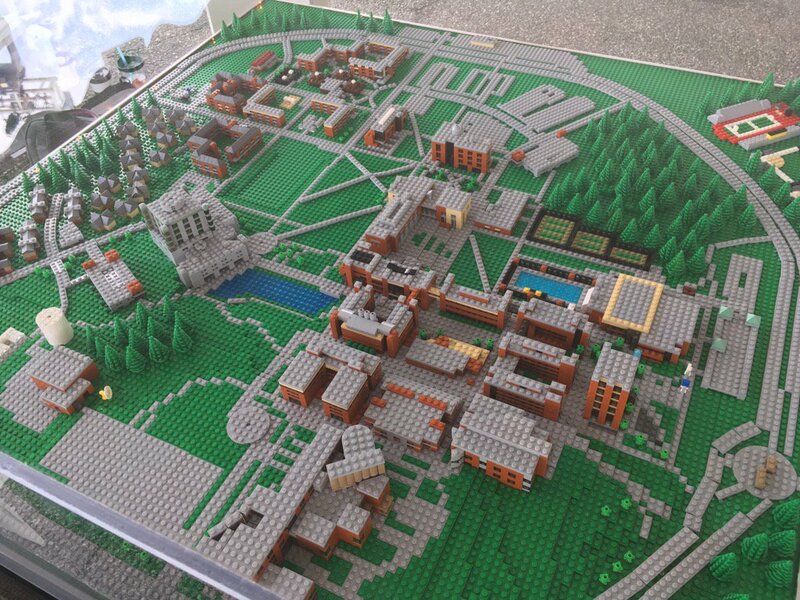 A Lego model of campus, constructed by Jason Burik ‘00, psychology, proved particularly popular for visitors of all ages. The Dawg Pound, hosted by UMBC Athletics, also drew crowds, showcasing UMBC scholar-athletes signing autographs, a display of UMBC’s NCAA trophies, games, a photobooth, and a performance space. Lego model of UMBC by alumnus Jason Burik. 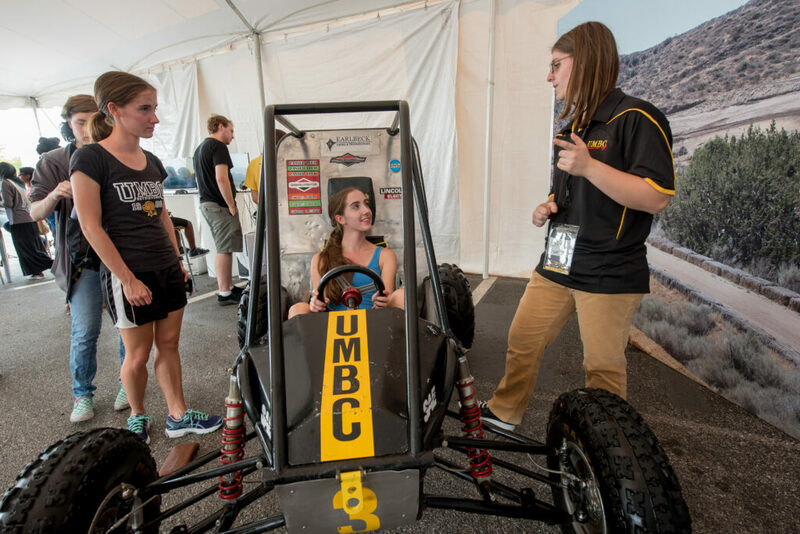 At the UMBC Racing team’s station, guests explored two Baja racing cars alongside footage from past races that showed the challenge and excitement of steering a vehicle along treacherous courses. Students, alumni, and future Retrievers, some who couldn’t yet reach the pedals, enjoyed a chance to sit in the driver’s seat. Festival-goer tries out UMBC Racing’s Baja vehicle. 3D-printed braille rings developed by UMBC’s Prototype and Design (PAD) lab and an interactive “Cranes in Motion” display, which enabled visitors to guide the motion of animated birds on a screen, were crowd favorites. Guests also had a chance to build and race their own boats from upcycled materials, and to use items like bouncy balls, playing cards, and frying pans to create unique percussion music. Through Celebrate Science, held in UMBC’s College of Natural and Mathematical Sciences facilities, kids had a chance to make slime, sort M&Ms to learn about mathematical concepts, detect sunspots, see a model of a satellite, play with magnets, and explore how a square block can roll. Science learning station at the House of Grit. Visitors later gathered for the long awaited Puppy Parade [watch live video]. 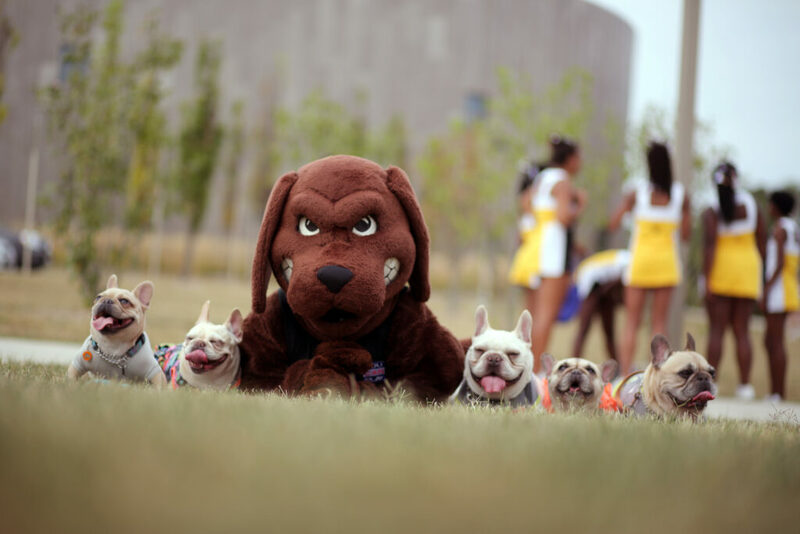 Featuring dozens of dogs of all ages and breeds, UMBC’s own True Grit, dancers, and musicians, the parade was a highlight in Baltimore Sun coverage of the festivities. True Grit with pugs at UMBC’s Puppy Parade. 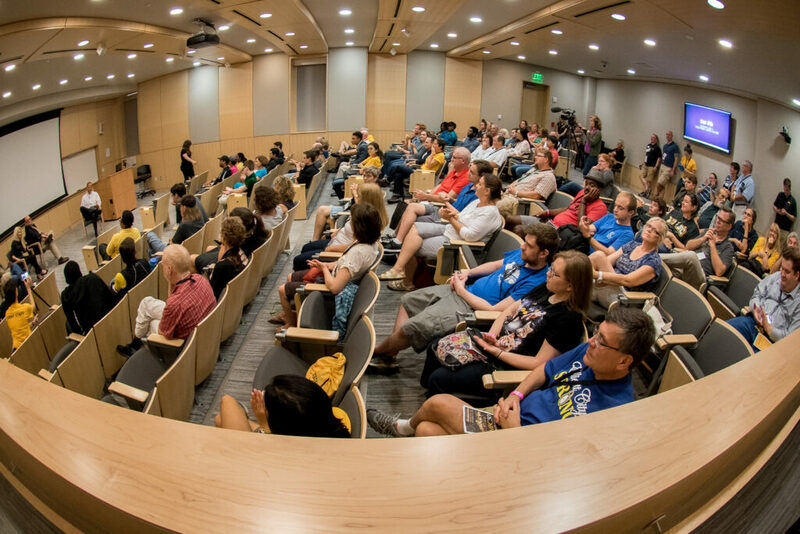 George Derek Musgrove ‘97, history, associate professor of history, moderated a lighthearted alumni panel on the UMBC student experience over the years. Steven Fedder ‘72, American studies; Shari Elliker ‘83, interdisciplinary studies; and Oliver Myers (M1) ‘94, M.S. ‘96, Ph.D. ‘07, mechanical engineering, shared memories of their time as students. Myers reflected on his unique experience as part of the first class of Meyerhoff Scholars, and how UMBC offered him unparalleled opportunities to connect with world leaders in science and government on their frequent visits to campus. Pres. Hrabowski speaks at the UMBC Stoop Storytelling event. A sea of Retrievers wearing glowing bracelets at the festival finale. Header image: Fireworks display at UMBC’s 50th anniversary celebration. Photo by Dan Bailey. Additional photos by UMBC staff and freelance photographers.